I need to get a quick blog post up; need to at least let you know I have not skipped out full-time fishing, turkey-hunting, and mushroom-picking this spring . . .
My folks were in town for the Easter holiday and stayed an extra day, so I dragged my dad along with me to the HUSKERland Muskie Hunters meeting last night. We had a great turnout and a great time discussing Nebraska muskies. Thanks, for having us! I told the attendees last night, will repeat it again here, that I am thrilled that we now have a chapter of Muskies Inc. here in Nebraska! I love it anytime anglers take an interest in their resources! An organized group like the HUSKERland Muskie Hunters tells me there are anglers out there who care about our resources and that there are anglers out there who will be active partners in the management of those resources. Our Nebraska chapter of Muskies Inc. is not a large chapter by any means, but they have already stepped up and helped us in the production of muskies for stocking in Nebraska waters. I have posted links here in my blog before, and am going to “plug” them again; I would encourage all Nebraka anglers to get involved with groups like the HUSKERland Muskie Hunters. By being a part of a conservation organization you can accomplish even more for the fisheries resources you love, AND you will learn how to catch more fish in the process! Here is the link to Muskies Inc., http://www.muskiesinc.org/ , and here is the link to the HUSKERland Muskie Hunters, http://www.mi53.org/Huskerland/Home.html . If you are interested in other Nebraska fishing organizations, I posted links to those of them that I am aware of in a previous blog entry, https://barbsandbacklashes.wordpress.com/2009/11/03/join-a-club/ . I know of another organization that I did not include in that previous blog post, and that is the Bowfishers of Nebraska, http://www.bowfishnebraska.org/ . If there is a Nebraska fishing organization that I have overlooked, let me know about it! Spent some time on the water last week. With the warming weather we had last week the fishing really took off! If you read my March 29 blog post, read it to the last paragraph, https://barbsandbacklashes.wordpress.com/2010/03/29/my-biggest-bass/#more-792 , you might remember that I predicted last week would be a good week to get out and do some bass fishing. Well it was! 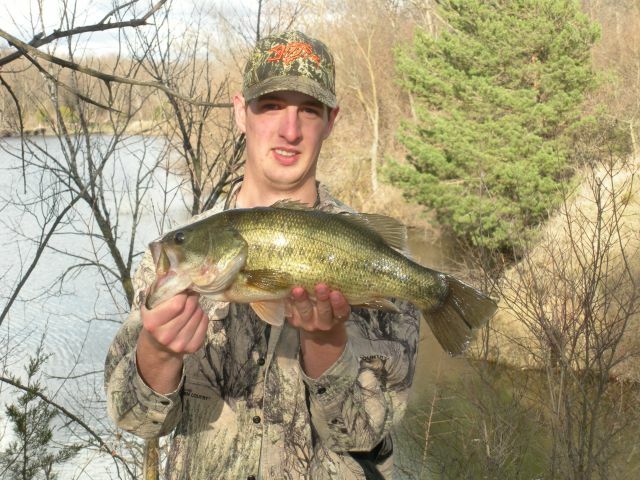 Daniel with a 20-inch largemouth he caught last Friday afternoon. I heard several other reports of some good bass caught last week. You can see in the backround of the photo I just posted that fish was hanging out in a protected area, out of the wind, where the water was a little bit warmer. 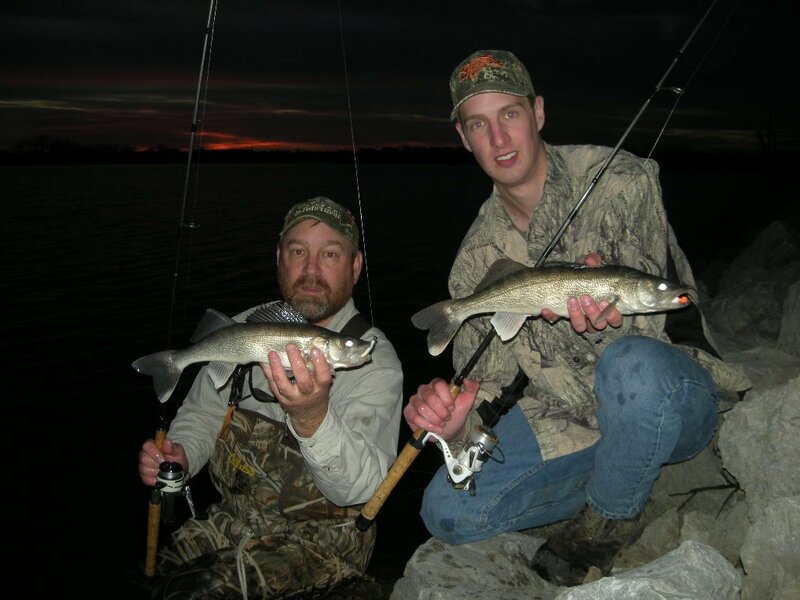 Earlier in the week we slipped out one evening to see if we could catch some fish and found out that indeed the walleye spawn is on. As I always say, April 1 the walleyes will be spawning. A couple of males were willing to bite. They are also ready to spawn. We are going to have a cold front blow through the state today and tomorrow as is typical every spring, and that will probably make the fishing tough for a day or two. But warmer weather is back in the forecast after that and the fishing will rebound. I am finding water temps. in the mid-50’s on some of our eastern Nebraska reservoirs and several species of fish are becoming more active and easier to catch. If you have not already, review the 2010 Fishing Forecast and pick out a spot to fish, http://www.ngpc.state.ne.us/fishing/pdfs/FishForecast.pdf . This time of year everybody is anxious to get out and give their spring fever a little bit of treatment. The fishing will be hot and cold depending on the weather, but it is time, GO FISH! Oh, I almost forgot; I also got checked by one conservation officer and one county sheriff over the weekend! I guess I looked suspicious. Ha. Did you stage this photo? You usually do not see night (or anytime) Walleye photos with the jigs still attached. I’ll bet this is a diversion. You really got ’em on stick baits and son’t want anyone to know. Nope, photo was not staged, fish were caught on jigs. Nice going on those fish. What I like about your reports and photos are that they consistently show father and son out on the water together. That’s awesome, wish it was the norm. You guys might be shocked to know how long it has been since I have been on a shocking-boat or pulled a frame (fyke) net. Let’s just say I spend A LOT more time with a fishing rod in my hand. You know I have done a lot of fishing by myself over the years, that has never bothered me, but it is great to have the kids to go along with me! And you know what, we catch more fish that way too! Oh yeah, then there is all that quality time together and all that other “stuff”. Ha. Glad you had some fishing luck. We had 4″ of snow last night. Not the first time your fishing group has looked “suspicious”! OK, since my niece brought it up, I have to tell the story. I was on the way home from a day’s fishing with her brother and 3 of her cousins in the pickup with me. We passed a county sheriff on the highway and he spun around and dropped in right behind us. Tadd, was sitting up front with me and I looked at him and shrugged my shoulders, I was not speeding. Pretty soon the “county mounty” turned the lights on and pulled us over. Seems as though my nephew Tadd matched the description of some guy who had just grabbed a case of beer from a local “Quick Stop”, and my pickup matched the get-away vehicle. The funny part is I have never drank a beer, not even one beer in my whole life and I am driving a pickup full of underage boys! I guess we looked suspicious. Ha. The deputy asked if he could search the vehicle for the beer; I said sure, go ahead. The boys and I piled out and walked towards a nearby creek to look for chubs while he searched the vehicle. He only looked for a minute or two, gave up after trying to sort through my 50-pound tackle box. We still laugh about that! And now all of you know “the rest of the story”.